Questions on the Toro Dual Force TimeMaster? without changing the blade or engine speeds. 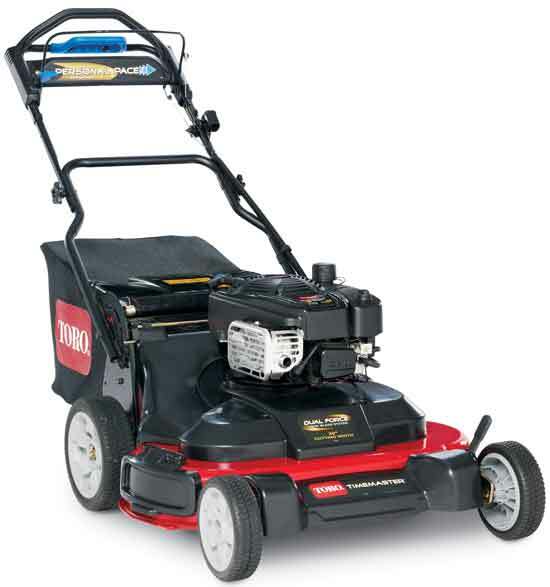 You can mow large, open areas with the high speed to finish quickly, or easily slow to the low speed for controlled maneuvering around trees, gardens and landscaping. The Toro TimeMaster will get the job done faster. is recycled back into your soil - giving you a great looking cut and a healthy, rich lawn. Ownership is worry-free with the TimeMaster's 3-Year Full Warranty and 3-Year Guaranteed-to-Start promise. If it doesn't start on one or two pulls, we'll fix it for free. See us for details. maneuver around landscaping, trees and shrubs, making mowing a large yard almost effortless. TimeMaster to the requirements of its application.